There’s a long stretch of dreary weather and barren landscapes to slog through between here and spring. If your budget doesn’t include a Caribbean vacation, escape to an oasis closer to home. Inside the spectacular conservatories of notable metro-area public gardens it’s a whole different season, balmy and bright with living color. A visit to the New York Botanical Garden in the Bronx or Longwood Gardens near Philadelphia is an easy and worthwhile road trip for the chlorophyll-deprived. Under soaring roofs of glass, landscapes of exotic plants are arranged for your pleasure. Arriving at either of these venerable and expansive glasshouses is positively theatrical. At NYBG’s Enid A. Haupt Conservatory, you enter through a vast rotunda that shelters towering palm trees. At Longwood’s East Conservatory, doors open onto a sparkling pond surrounded by banks of flowers and foliage. Breathe in the richly fragrant, heavily-oxygenated air — sweet relief. Each of these two sites is prepared with special exhibitions for the winter-weary. Longwood offers its annual “Orchid Extravaganza” Jan. 19 through March 24, featuring one of the largest and most diverse plant families on earth. At NYBG, “Singapore” is the theme for an orchid exhibition running Feb. 23 through April 28. Picture yourself amid the Haupt’s dazzling array of tropical species – crayon-colored crotons, brilliant bougainvillea, intricate fuchsias and jewel-toned hibiscus, not to mention the orchids. Be sure to explore the rest of the conservatory with rooms that take you to rain forests, cactus-filled deserts and other unique habitats. Longwood’s orchid fest includes more than 5,000 orchids displayed in extraordinary ways. There are yellow and white “moth” orchids hanging in gigantic orbs, floral arches studded with vivid blossoms and a waterfall of golden-red orchids ushering visitors into the cascade garden. Here, too, go beyond the exhibition hall to explore the indoor children’s garden, Mediterranean and tropical gardens, a palm court and more. Each garden offers on-site dining options, so plan to make a day of it. It will be one of the very best days of your winter, guaranteed. For a smaller-scale orchid show closer at hand, check out the Deep Cut Orchid Society’s annual show Feb. 7-10 at Dearborn market, 2170 Route 35, Holmdel. Hours for the show, the largest in New Jersey, are 9:00 a.m. to 6:00 p.m. Thursday through Saturday and 9:00 a.m. to 4:30 p.m. on Sunday. Admission is free. WHAT AND WHERE: Built in 1921, the conservatory houses 20 gardens within four acres under glass at the former estate of industrialist Pierre du Pont, a site covering 1,077 acres. Located off Route 1, three miles northeast of Kennett Square and 30 miles southwest of Philadelphia in Pennsylvania. For directions, call 610)388-1000 or visit longwoodgardens.org. WHEN TO GO: Open daily 9 a.m. to 5 p.m. through March 24. WHAT IT COSTS: Entrance to the conservatory is included with admission to the grounds. Prices for the “Orchid Extravaganza” are $23 for adults, $20 for seniors, $12 for students 5 to 18 with children four and younger free. Purchase tickets on the web site or by calling 610-388-1000. ACCESSIBILITY: Equipped with elevators and automated doors. About 50 non-motorized wheelchairs may be borrowed free at the Visitors Center on an unreserved, first-come basis. 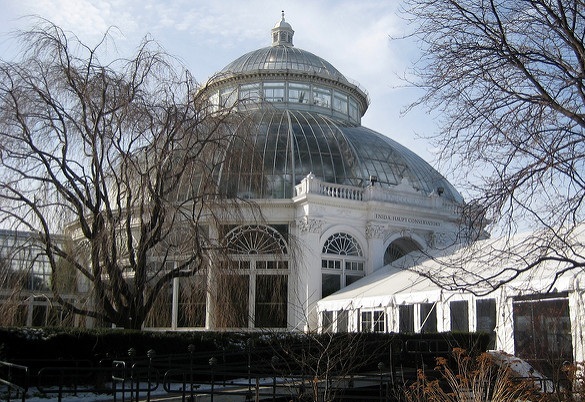 WHAT AND WHERE: The largest Victorian-era (1902) glasshouse in the United States, named for philanthropist/gardener Enid A. Haupt in 1978. Located at the New York Botanical Garden, a 250-acre site off Kazimiroff (Southern) Boulevard in the Bronx. For directions, call (718)817-8700 or see nybg.org. WHEN TO GO: Open year-round from 10 a.m. to 6 p.m. Tuesday through Sunday and on holiday Mondays. WHAT IT COSTS: Admission includes access to the grounds. For the “Singapore” exhibit, admission is $23- $28 for adults, $20 for seniors and students, $10 for children two to 12 and free for children under two. Parking is $5 per car. Purchase tickets in advance on the web site or by calling 718-817-8700. ACCESSIBILITY: The conservatory is stroller and wheelchair accessible, with elevators circumventing steep grades and stairs. Also available are tram and golf-cart tours of the grounds.